The particularly handsome example of fomes fomentarius, otherwise known as the tinder polypore, pictured above was found on the Huckleberry Loop trail in July 2017. It remained on the tree because that was the only example to be found on the trail that day. Sustainable foraging means taking only some of what you find and leaving the rest behind to propagate. However, if you’re in the wild or lost, an old, dry tinder polypore serves as an efficient fire starter, especially useful in winter hiking if you ever get stuck somewhere and need to start a fire in wet conditions. This year, it seems like a trial winter just sprang out from behind a long, drawn-out autumn to surprise us and now is the time when temperatures fluctuate wildly from day to day. Hikers need to be sufficiently prepared and it’s easy to get caught out. Otzi, the pre-historic hiker from about 3100 BC who was found in the Alps – by modern hikers – mummified and preserved in ice on the border of Austria and Italy back in 1991, was reportedly wearing several pieces of tinder polypore on a string around his neck. Also, called hoof fungus, tinder conk or iceman fungus the tinder polypore acts like a coal. You may not have much of a choice in the matter, but pick a specimen that is hard to the touch and old, not fresh. Inside this polypore is a substance called amadou. Amadou is a spongy, drying layer inside the fungus. You can break open the polypore, set the innards alight and it will slowly smolder, warming everything around it, including damp tinder or kindling. Place it strategically, in the center of a small starter campfire, covered with tinder, then kindling on top of that and then small, seasoned branches in the shape of a teepee on top. Find our guide on how to build a good fire here. This fungus can be tricky to identify, but differs from other polypores as it looks assuredly like a hoof that grows out of a tree, as opposed to most other polypores that are flat or shelf-life, and is found on living or dead deciduous trees, stumps or logs. Their color is gray to grayish-brown, but usually they’re recognized by the grey cap. Birch polypores are also fire starters but they are smooth, beige and only found on birch trees. 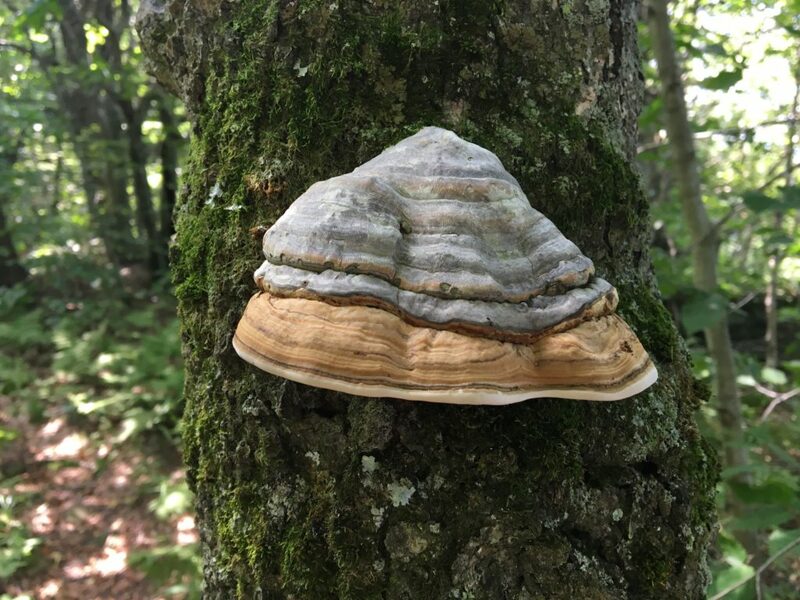 This entry was posted in Foraging, Hiking The Catskills and tagged Catskills, Catskills Hiking, Hiking the Catskills, Tinder Polypore on November 20, 2018 by JNUrbanski.